Written by Rob Evans on 04 July 2007 . Written by Mark Suret on 04 July 2007 . I've just had a mail from Mark Livesey who has had to cancel Saturday's training day due to a lack of interest. Sorry to all those who were booked to come, but I'll try to organise something else later in the year if people want to take him up on this again. Written by Gareth W Morgan on 03 July 2007 . Written by brian hawkins on 02 July 2007 .
on 02 July 2007 . OK, this version 3 of the cardifftri.net website. Read the articles below and get posting! Feel free to duplicate old articles here. on 19 June 2007 . You could upload your image to an online photo service like Flickr or photobucket. Then grab the HTML for the link to the photo and stick it into your post by clicking the insert image button in the toolbar. Remember that we also have a Cardiff Tri Flickr Group that you may want to add your photos to. to resize it and upload it for you. You can also ask me to add it to the news article for you, or add it yourself using the "images" panel at the bottom of the "add content" page. 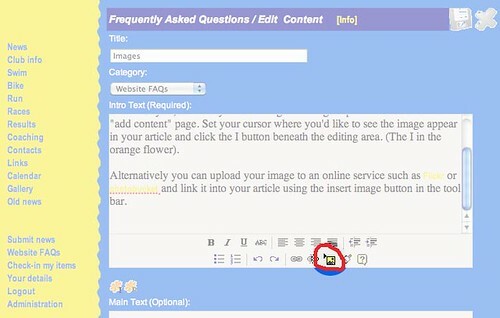 Set your cursor where you'd like to see the image appear in your article and click the I button beneath the editing area. (The I in the orange flower).